Located 770m above sea level and 140 Kms from Bangalore, Mysore, the imperial city, was the erstwhile capital of the Wodeyars. Also known as the city of Palaces, Mysore has never failed to mesmerise the tourists with its quaint charm, rich heritage, magnificent palaces, beautifully laid-out gardens, imposing buildings, broad shady avenues and sacred temples. 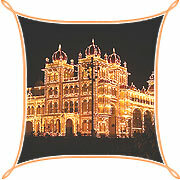 Mysore is certainly a charming, old-fashioned and undaunting town dominated by the spectacular Maharaja's Palace, around which the boulevards of the city radiate. Nearby is the city centre with the colourful and frenetic Devaraja Market is inviting a stroll. On the outskirts of Mysore, Srirangapatnam still harbours architectural gems from the days of the great Indian hero, Tipu Sultan, and the magnificent Hoysala temple of Somnathpur lies little more than an hour's drive away. Badami Caves : The capital of the Early Chalukyas, Badami is picturesquely situated at the mouth of a ravine between two rocky hills, Badami is famous for its cave temples - all hewn out of sand stone on the precipice of a hill. Badami is an interesting place to visit in Karnataka what with its artificial lake, ancient temples, Museum and Hindu and Jain caves carved in the Sandstone hills. The largest and most ornamental is the third cave temple dedicated to Vishnu. Overlooking the cave temples is a reservoir dotted with temples dedicated to Vishnu and Shiva. Also a must are the Bhutanath temples that lend their name to the lake beneath the cave temples. The main attractions of Badami are the caves found there. Gol Gumbaz : Gol Gumbaz, situated in Bijapur is an astounding engineering feat. Its enormous "Whispering" dome is second in size only to St. Peter's Basilica in Rome. The dome is the second largest in the world, 124 feet in diameter. The dome stands unsupported by pillars. The fantastic acoustical system in the dome carries the faintest whisper around the dome and returns it to the listener nine times. Hampi : Hampi, the land of surprises was founded in the middle of 14th Century by two local princes, Hakka & Bukka. The Vijayanagar Empire came to be celebrated for its might and wealth and as a show piece of imperial magnificence. Vijayanagara is such that the pupil of the eye has never seen a place like it... " So eulogized Abdul Razaq, a Muslim envoy who visited Hampi. Nandi Hills : 60 kms north of Bangalore is the summer resort called Nandi Hills. Also known as Nandidurga, it was one of the summer retreats of Tipu Sultan. Nandi Hills was popular with the British too who built bungalows and laid out gardens here. Today of course, it's a hot favourite among Bangaloreans who find this an ideal get-away for weekends. The 1478-m high Nandi Hills is the originating point of many rivers. And the forests surrounding the hills, abound with wild animals. Around the Nandi Hills are several smaller hills, which can be visited on foot.